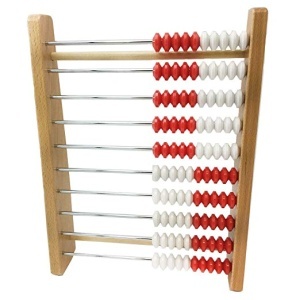 This post explains how to use a school abacus (100-bead abacus) to teach the basic concept of division, in particular, the measurement division (as studied in 3rd grade math). Sharing division — the name tells you what it means. 16 ÷ 2 is thought of as, "If there are 16 beads divided between 2 people, how many does each one get? Quotative or measurement division. You think how many groups of the same size you can form. Or, you think, "how many times does the divisor fit into the dividend?" For example, 16 ÷ 2 is interpreted as: "If you have 16 beads, how many groups of 2 beads can you make?" Sharing division is easy to understand as a concept, but it is hard to perform without the knowledge of the multiplication tables. Just imagine a child who doesn't know the times tables trying to find the answer to the question, "If there are 56 strawberries and 8 people, how many will each one get?" It will take some guessing and checking. But quotative or measurement division is easy for children to do with the help of manipulatives or by drawing pictures. Just make a group of 56, and start forming groups of 8 out of it. Once you're done, check how many groups you got. There is no guessing. It is just repeated subtraction — each group the child forms is "subtracted" or set apart from the rest. And this activitity lends itself perfectly to the 100-bead abacus, as well. For example, let's look at 20 ÷ 4. Note that the red group is formed from 2 beads on one bar and 2 on the other. Answer: 5 groups. Form one group of 9 from the first bar (green), another from the second bar (blue). The third group is the purple ones. We get three groups (that's the answer). Groups of fives are particularly interesting since they look so "orderly" on the abacus. Ask your student, what is 90 ÷ 5? You can, of course, use abacus for sharing division, too. However, it's best to use numbers that make the sharing division easy to do mentally, such as 20 ÷ 2 or 24 ÷ 2 or 15 ÷ 3. Tying in with the basic concept of division are simple division word problems that typically involve both the equal-sharing and measurement division situations. Sometimes the problem asks how many are in each group, and sometimes it asks how many groups there are. Children need to become familiar with both situations. Alice packed 240 candles in boxes of 30. How many boxes did she get? Alice divided 240 candles equally between eight boxes. How many candles were in each box? Your child or student can get plenty of practice with both kinds of division word problems with Math Mammoth Division 1 worktext, or in grade 3 of the Light Blue series curriculum. Once the concepts of quotative division and sharing division are clear, the next step is to spend some time studying the connection between multiplication and division, because that is what students need to learn to use in order to solve simple division problems mentally — not manipulatives or pictures.